The Philosophy and Religion Department at Truman State University is dedicated to freedom of thought and inquiry. The various aspects of the study of philosophy and religion reflect some of the quintessential efforts of human beings throughout history to know themselves, their society, and their purposes in life. Philosophy has also sought to free individuals from the forces of ignorance, fear, and injustice in society. The exploration of religious traditions likewise requires students to see the world as others have and to challenge their perceived notions about what is “true” and “right” in the world. The support for critical inquiry on the part of our Philosophy and Religion faculty inevitably goes hand in hand with the advancement of knowledge and the personal, social, and intellectual growth of our students. Capacity for open-mindedness and ethical sensitivity. The philosophy and religion major is flexible, and almost half our students are double majors. 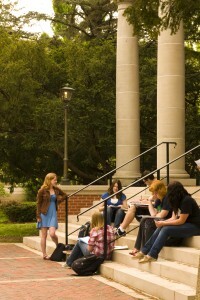 It is an area of study that can be integrated with any other field in the liberal arts. It is also a great complement to pre-professional programs, especially in education and health sciences — fields in which our majors regularly find jobs after graduation. I entered the PHRE degree program because of interest in the subject matter rather than having a firm grasp on what I wanted to be when I grow up. Through a robust curriculum and tremendous faculty, I learned skills that have helped me thrive throughout my career. My PHRE degree provided me with skills in research, logic and argumentation. Perhaps most importantly, I learned how backgrounds and ideas influence belief and how to communicate with diverse groups by being mindful of others, a skill that is important in any career field. Check out the following photos from Dr. Pflueger’s field trip to the Hindu temples of St. Louis with his PHRE 310 class. See the Truman Index article detailing this exciting new initiative.